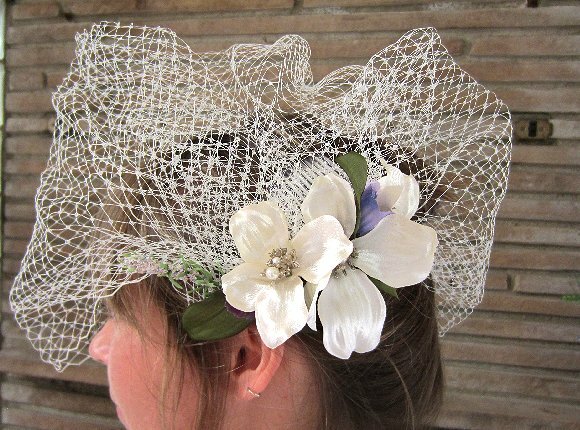 Our lovely birdcage bridal veil is made with lots of fabric to fit a variety of hair styles. It's easily adjusted to fit more closely than seen in the images above. 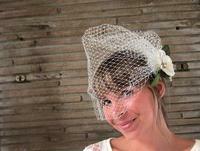 The birdcage bridal veil has a large comb for secure fit to the bride's hair. I've sewn beautiful ivory silken blossoms and leaves to the comb, with a few purple and periwinkle blooms peeking coyly out from the sides. There's even a sprig of 'silk' heather for luck. 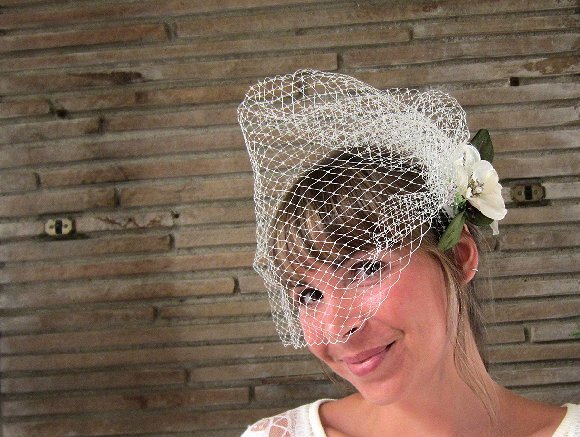 The birdcage bridal veil is feminine and contemporary at the same time; just the sort of one-of-a-kind accessory you'd expect to find at SPARKLE PLENTY.